So you found a piece of Roycroft copper and you want to know what it's worth. 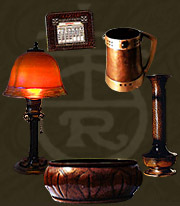 Or, you're a Roycroft collector, and you'd just love to check out some cool Roycroft stuff. In either case, you've come to the right place. Here you'll find history, interesting facts, tips on collecting, hundreds of photographs, as well as descriptions and estimated current values of an array of Roycroft copper items. 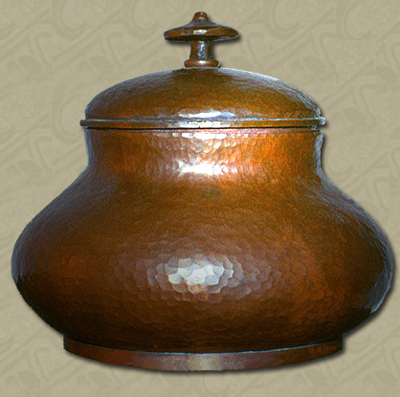 The purpose is to provide an up-to-date resource for identifying and pricing Roycroft copper, and to address the current scarcity of information on the Internet about these highly collectible antiques. 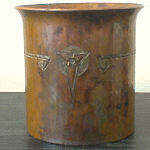 Although by no means comprehensive, this site includes a range of copper work produced by the Roycrofters such as vases, lamps, candlesticks, bookends, bowls, etc. Although several price guides are currently in print, recent growth in demand for Roycroft metalwork, and objects from the American Arts and Crafts Movement in general, has caused prices to increase dramatically. Therefore, in most cases, prices in the printed guides are now outdated. In addition, many pieces on this site do not appear in any of the printed price guides. The values on this site are solely based on my own experiences collecting Roycroft items through auctions, antique shows, private dealers, flea markets, etc. These are my own opinions, and the prices you get or pay will vary based upon condition of the pieces and whether fate is smiling on you that day. Roycroft copper was a product of the Copper Shop of the Roycrofters, a craft community in East Aurora, New York during the early part of the 20th century (for more information about The Roycrofters, visit the Webpage Of The Roycrofters). Produced from about 1906 into the 1930s, Roycroft copper items were made in a small shop staffed with, at most, 30 or so craftsmen. Roycroft items were intended to be well made, beautiful, useful objects for the home, and as such, were an expression of the Arts and Crafts Movement in America. Although stylistically, Roycroft copper reveals influences from European Art Nouveau, Vienna Secession, Classical and even Medieval forms, the result was distinctly American Arts and Crafts. For this reason, Roycroft copper is recognized today as an important part of the history of 20th century American design. 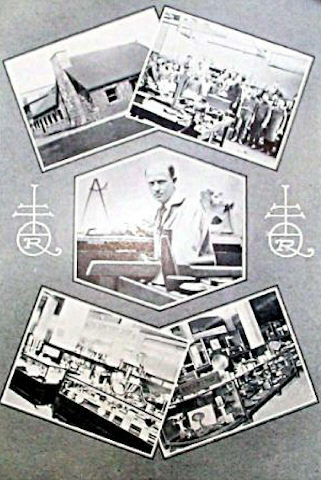 These photos include a view of the exterior of the Copper Shop, the Copper Shop staff, Karl Kipp (the Copper Shop manager), and two views of Roycroft retail displays. 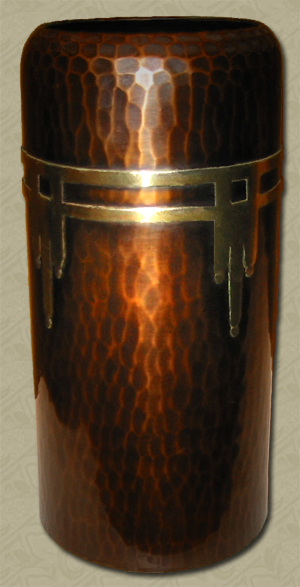 Although all Roycroft copper was crafted at least in part by hand, as evidenced by the hand-hammered surfaces on most items, there was a wide range of quality in the work. This means that the piece you're holding today could be really special, or a more routine example of Roycroft production. After browsing through the pieces listed in this site, hopefully you'll be able to tell the difference. These three vases illustrate some of the hallmarks of Roycroft's best work: simple shapes, subtle balanced decoration, and quality hand-craftsmanship. Their values, from left to right, are approximately $1,500, $800, and "$a boatload of cash". How can I identify a piece as Roycroft? Roycroft marked almost all the items they made. The mark is referred to as an "orb and cross" which encloses the letter "R". Some variations were used over the years, and you can see them by visiting the Marks page in the Gallery. I've taken photos of an array of Roycroft pieces from my own collection, other collections, and pieces that have sold on internet auctions and added brief descriptions, estimated values, and an occasional unsolicited opinion. 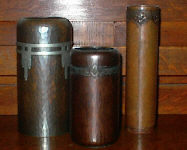 Most of the pieces shown here were produced during the early to middle period of Roycroft production (up until the mid-twenties). I've also included items made by Roycrofters Karl Kipp (at his Tookay Shop) and Walter Jennings (wherever he made stuff) since they are so closely related to Roycroft items. In fact, signed Kipp and Jennings pieces are frequently superior in quality to comparable Roycroft pieces and are also worth more today. This site is stronger in terms of vases, candlesticks, bookends, and lamps, and less so relative to desk and smoking items. That's simply a reflection of what's in my collection and the others I have access to and my own personal taste. When adding pieces to the site, I lean toward things that are rare or that I find interesting. Who really wants to see another letter opener or ashtray anyway?. In addition, for things like simple bookends, Roycroft produced many many variations. I have several representative examples listed but I'm not likely to list more. Most simple bookends generally fall into the $150-300 range. So if you find a pair on this site similar to yours, but not indentical, assume the same value. What about the finish or "patina"? 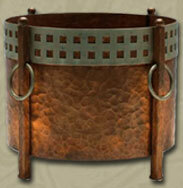 Roycroft applied special finishes to their copper wares. 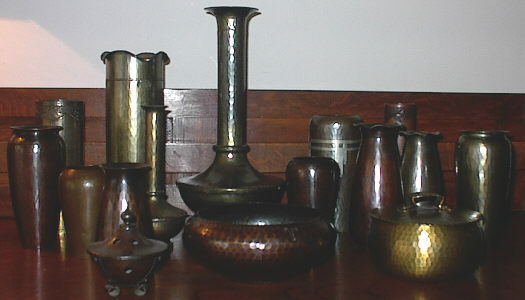 Three primary finishes were used, called Aurora Brown, Old Brass and Modern Sheffield (silver). Most collectors prefer Aurora Brown, so items in that finish are typically more valuable today. It is important to try and preserve Roycroft's original finishes whenever possible. These finishes are somewhat delicate, as they can be scratched, worn away over time, or damaged with chemicals. Although Old Brass and silver look pretty unattractive when they're severely worn, a piece with a slightly worn ORIGINAL brass finish is certainly preferable to one with a NEW brown finish. When in doubt, do not clean anything. If you're convinced that your pieces will look better after a cleaning, my advice is to wash VERY gently in warm soapy water, let dry, then apply a light coat of paste wax. 1. What is my piece of Roycroft worth? Answer: I can give you my opinion. See the Appraisals page. But remember: IF YOUR PIECE IS IN HORRIBLE CONDITION, IT IS NOT WORTH THE SAME AS MY REFERENCE EXAMPLES -- my pieces are "very good" to "excellent" condition unless otherwise noted. Condition is EVERYTHING! So your trashed and cleaned American Beauty Vase is probably worth more like $500 rather than $5000. 2. 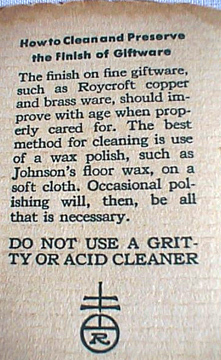 Where does one go to get a piece of Roycroft "repatinated"? Answer: Right now your best resource for Roycroft repair and refinishing is Chris Banich in Atlanta (Phone: 770-262-2770). Chris does a really wonderful job of bringing damaged Roycroft pieces back to life. He can do several accurate variations on Roycroft's brown finishes and I've seen examples of his work where the refinish is virtually indistinguishable from the original. He's also affordable and provides quick turnaround. Now if you don't want to spend any money to make your Roycroft brown again: if your piece is early (pre-1920-ish), and never had a lacquer coat, just put it outside for a few months -- it'll get brown again (keep it dry though since you don't want it to turn green). If your piece is later (post 1920-ish) and originally had a lacquer coat (the shiney snake-skin like brown finish), then either sell it, learn to love shiney copper, or put it outside and make it "early brown". 3. What is the formula for Roycroft's Aurora Brown finish? Answer: I don't know. Really. I have heard lots of theories, but I dont think anyone knows for sure, and it probably changed in the Roycroft Copper Shop over time (1909-1930). Some people use liver of sulfur, but to me that process yields a color that doesnt look quite right -- either too muddy or too purple. I've seen the results of other techniques as well, but I dont think anyone has nailed Aurora Brown yet, especially the later finish with a laquer coat. Volumes have been written about metal patination, so feel free to hit the library and work on it. Here's an old page I did with a "case study" on refinishing. 4. How do I know what Roycroft is worth? Answer: I'm an active collector, and I watch every piece of Roycroft that sells at the auction houses, on ebay and at the shows. So, I think I'm as close to the Roycroft market as anyone. The values listed represent an estimate of RETAIL prices based on the shows and auctions I've seen. By retail, I mean the price that a dealer would charge or the sale price at a major auction house (including buyers premium). Keep in mind that if you are selling, it is difficult if not impossible to end up with this amount in your pocket. I have heard that people have quoted prices from this site to auction houses and asked for reserves equal to my high estimates. That's not the way the market works, so please don't do that. If you're not selling directly to a collector, it's going to cost you to sell something. Sometimes my price ranges are a little wide, because I've seen almost identical pieces go for very different prices. After all, these are antiques, not Big Macs. And strange things can happen in the marketplace so the latest high sale price does not necessarily constitute a new level of value. As they say in the auction world...the first one to hit a record price went too high, while the second one at that price sold at market value. And remember, condition is extremely important in terms of value. Although Roycroft produced many standard forms, after 80 years of use, each piece is unique. Keep in mind that my estimates are for the exact pieces pictured, i.e. when comparing a piece to mine, same form + same finish + same condition = same value. Where I've listed auction results, the price listed includes the hammer price plus the auction house's buyers premium. If you disagree strongly with my estimates, well, build your own site. 5. What is the purpose of RoycroftCopper.com? The only purpose is to share info about Roycroft copper. And to let everyone see some of the really rare pieces of Roycroft that are stashed away in collections. This site is a labor of love. Here's how it came to be: One day back in 1999 I was surfing the Web and thinking it was strange that there was virtually nothing about Roycroft copper on the Internet. I was having one of those "Somebody should really..." moments when I realized I had the makings of a basic Roycroft copper site all around me. That afternoon I went out and bought a cheap digital camera and a basic html book, and by the next afternoon the first version of roycroftcopper.com was up on the Web. It has grown quite a bit since then. Of course, it's still a work in progress, and will continue to grow as I'm able to photograph more pieces and other collectors send me photos. Many of the wonderful pieces now shown on this site are courtesy of generous collectors who went to the trouble of providing me with jpeg pictures. I can't stress how much I appreciate getting pics, since new and interesting pieces make the site better and more enjoyable for all of us. So if you have a nice piece that is not represented here, please send me a pic! I've tried on this site to share what facts I've acquired through reading, studying pieces and talking to dealers, other collectors and scholars. If I've made a mistake, forgive me. And if you have wisdom, share it! If you have a question regarding anything on this site, would like help in identifying and/or pricing a piece of Roycroft metal, or are interested in selling a Roycroft item, please email me at dave@roycroftcopper.com. I'm located in Manhattan and am also happy to provide opinions on finer pieces in person. And I love getting feedback, so let me know what you think of the site -- positive or negative!